Fludes Carpets- a family run brand that you can trust. 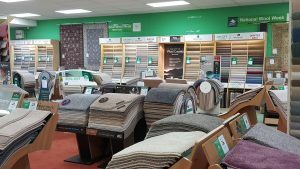 Fludes Carpets has been providing flooring for homes and businesses throughout Sussex and the south of England for almost 90 years. We believe that our customers expect us to be knowledgeable, friendly and helpful in providing the right answer for all of their flooring needs. We genuinely care about what we do, and work hard to deliver a high level of satisfaction from our clients. We ensure that we have a wide range of flooring products and try to offer a good selection of brands and qualities to ensure that we have the right product for any request. We have friendly, knowledgeable staff members at all of our six stores that are based across the south of England. Many of our experienced staff members have been with the company for over 20 years and have accrued a wealth of knowledge about flooring solutions over this time. The company remains a family business that has its third and fourth generation family members still heavily involved in the business. Fludes Carpets support local charities and clubs and last year, and last year donated over £1000 to local charities. We adhere to the Carpet Foundation code of conduct, which is overseen by the Trading Standards Institute. We are also a member of the Buy with Confidence Scheme which helps our customers to know that we are a supplier that you can trust. Don’t Miss out on our amazing Spring discounts! We’re currently offering an amazing half price discount on carpet underlay! The discounts don’t stop there, our amazing Spring promotion also offers 10 or 20 months Interest Free Credit (see in store for details) and a further 30% off selected rugs. Be sure to make to make the most of the opportunity to spruce up your flooring this spring with the superb discounts available in the Fludes Carpets Spring promotion.